One of the quintessential things about British cinema, and something that for me separates it from anything else, is the preponderance of character actors- those that recur again and again in films playing unusual, quirky or eccentric characters without any designs on a major starring role. Thus, watching any British movie from the 1930s-1970s is like exploring a bran-tub: you know what might be in there but not when they will surface or in what guise. Two new releases from Odeon Entertainment, under their splendid ‘Best of British Collection’ banner, feature comedy films- the one genre almost guaranteed to yield a host of performers instantly recognisable to the eye. Given their generic similarities, both films are actually very different. The first, Trottie True is unusual in so far that it was made at the back end of the 1940s (1949 to be precise) in Technicolor. Thus, the vivaciousness of 1890s Music Hall society is wistfully conveyed in a colour process that has the nostalgic beauty of a Victorian greetings postcard. It is also less of a character actor film than its companion, although Michael Medwin and Bill Owen do feature prominently. Its star Jean Kent, now nearly 90, is, ironically, one of those actresses not as well known as some of her contemporaries whom she has now outlived, despite a film career that spanned over 40 years- 55 if one counts television appearances. 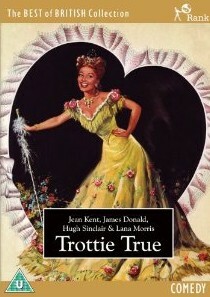 Although Trottie True is very much of its time, that is not to denigrate it in any way. True, it is hardly up to the mark of later British films such as The Ladykillers, but it is still the sort of film that, for all our supposed cultural sophistication and technical wizardry, we could not produce today. 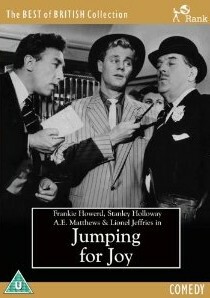 The other film to gain a release from semi-obscurity is Jumping For Joy (1956), a John Paddy Carstairs film that, unusually, does not star Norman Wisdom. Instead, we have a veritable roster of comedic talent headed by the nearly-always-great Frankie Howerd, ably supported by not only Stanley Holloway but A.E. Matthews, Alfie Bass, Joan Hickson, Lionel Jeffries and, naturally, Richard Wattis- perhaps the doyen of the British character actor scene. In combination, these gentlemen alone make this release worthwhile, whatever the sensibilities of the audience in dealing with comedy that is now 55 years old, but it is perhaps Frankie Howerd for whom this film is most memorable. There is a certain magic about seeing Howerd, by then a household name and major attraction, over a decade before his first Carry On appearance. Comedy is one of those genres which, despite its enduring appeal, has undergone radical changes along the way. The humour to be found in British comedy films of a certain era is often more than tinged with nostalgia, a pride in being British and standing firm against all-comers. It is for this reason that the final product was not always an export success, but almost always a domestic one. These two releases prove that there is yet more cinematic gold in the British comedy mine. Both 'Trottie True' and 'Jumping For Joy' are available on DVD from Odeon Entertainment.